Add extra ventilation wherever it's needed. This top quality, whisper-quiet Lasko Fan will provide ideal air circulation to your small growing space. Spring-loaded clip clamps to your greenhouse shelving, or any surface up to 1 3/8" wide. Lightweight casing is durable, impact-resistant plastic. Makes a great fan to put at your desk, too! 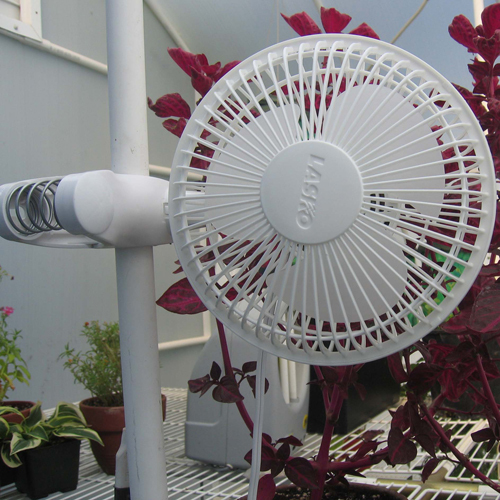 I purchased this Lasko Clip fan for my 8' by 8' greenhouse. When I received the fan, the directions said not to use it near moisture. I am using it anyway and it is working great.